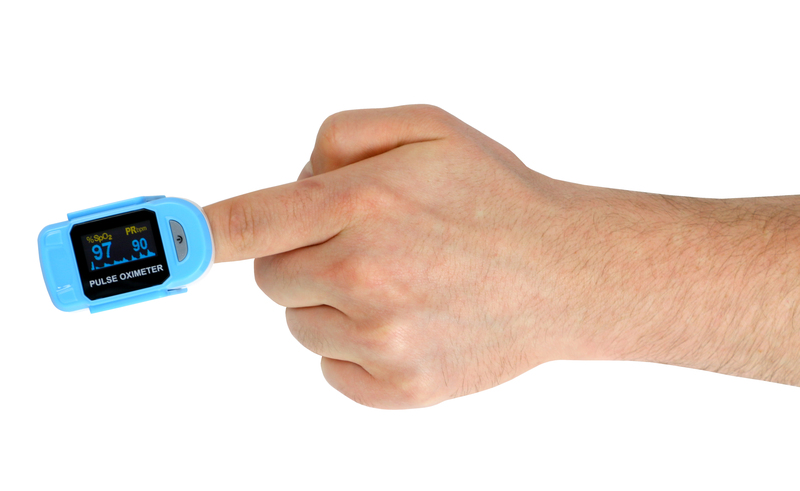 If you have ever been a patient at a hospital and had a pulse oximeter placed on your finger? That device is a measurement tool that is used to measure oxygen saturation, or the percentage of hemoglobin saturated with oxygen in arterial blood. In other words, pulse oximeters monitor the amount of oxygen carried in the body. Pulse oximeters are small, lightweight devices that are applied non-invasively, meaning there is no poking or prodding involved. It simply slips onto your finger with no hassle what so ever. Once attached, it sends two wavelengths of light through the finger to measure your pulse rate and how much oxygen is in your system. The screen from the device will display the percent of oxygen in your blood coming from your heart as well as your current pulse rate. This measurement comes in handy for those wanting to measure their blood oxygen levels. This type of device aids doctors in the diagnosis of a patient because it shows when oxygen saturation levels are not between the normal range of 95 percent and 100 percent. Pulse oximeters are not only available to doctors and hospitals, they are also available for home use. People with chronic obstructive pulmonary disease (COPD) and / or using supplemental oxygen, use pulse oximeters daily. This gives users a better handle on their oxygenation status while using oxygen therapy at home. If you think a pulse oximeter is right for you, please consult your doctor. For more info on pulse oximeters, click here.